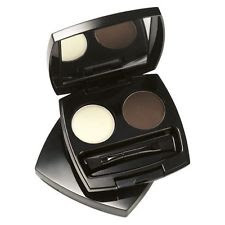 Avon Eyebrow Stencil Set - $4.99 - achieve the perfect arch with 4 stencils and a brow brush - the reusable stencils make it easy to accentuate your face with perfectly shaped brows. Step 1: Choose the stencil that best matches your natural brow shape. Step 2: Trace the shape onto your face with your favourite brow definer (like the one below). Step 3: Groom brows with the brush and comb.